Attorney Chris Olsen in San Diego, CA, will fight for your rights when you have been involved in a car accident. There are different types of auto accidents and various levels of damages. It is important that you secure the representation of an expert attorney with a strong track record. Chris Olsen has been practicing law since 2005 and has collected millions of dollars for his clients. Sometimes car accidents are straightforward. For instance, in cases where you are injured in an accident, the other driver was clearly at fault, and their insurance company pays compensation. Unfortunately, auto accident cases are often not that simple. Insurance companies may deny your claim, not cover medical expenses, or refuse to pay compensation for pain and suffering. In other cases, the other driver may have been uninsured or there may be a dispute about who was at fault in the accident. In situations such as these, Chris Olsen will conduct an extensive investigation of your accident to determine responsibility. This investigation may include witness interviews, review of police reports, photos of the scene, documents from the Department of Motor Vehicles, and expert accident reconstruction. Our team will closely examine your medical bills, lost wages, and property damage to determine the amount of compensation you need in order to cope with the aftereffects of an accident. A personal injury attorney like Chris Olsen can also help you find experienced doctors and file your insurance claim. Rear-end collisions: Being hit from behind can be devastating, whether you are sitting still or in motion. 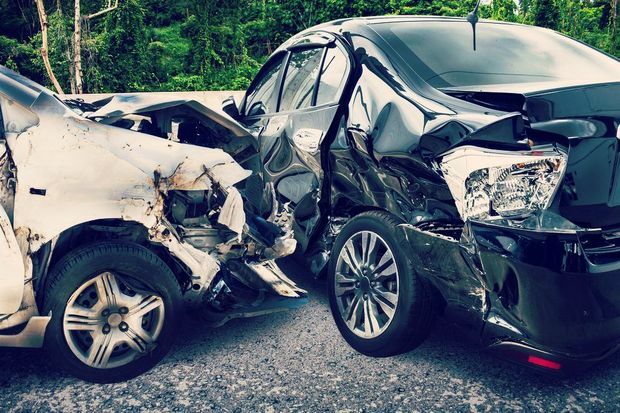 In most instances, a rear-end collision is the result of negligent behavior from distracted driving or by not devoting full attention to the roadway. The fault typically lies with the driver striking a car from behind, giving victims the opportunity to seek damages from that driver. If you are stopped and struck from behind, you might suffer injuries from being pushed violently forward. These injuries can involve striking your head, being hit by the airbag, or spinal cord damage from the severe forward and back motion. If you are hit from behind while driving, you may lose control of your vehicle and roll over, hit another car or object, or be ejected from the vehicle. Head-on collisions: When drivers fail to pay attention while driving and cross over a center line or drive the wrong way on a one-way street, a head-on collision can occur. The victim can be seriously hurt and may even suffer fatal injuries. Traumatic brain injuries and significant injury to the spinal cord and back are common in head-on collisions. Side-impact collisions: When motorists run lights or stop signs, the chances of hitting another car on the side is high. This type of accident is referred to as a T-bone accident. Passengers and drivers hit on the side are not normally protected by airbags and other safety features, which can lead to serious injury. Broken bones, cuts and lacerations, and internal bleeding frequently occur in side-impact collisions. Rollover accidents: A rollover accident can happen when cars lose control and overcorrect or when there is a manufacturing defect that affects a vehicle’s center of balance. A rollover accident is commonly associated with devastating injuries and even wrongful death. A rollover can cause injuries ranging from dismemberment to brain damage. Identifying the cause of a rollover accident is the key to recovery, and once liability is established it is critical to make a claim that covers current, as well as future medical and financial needs. Multi-vehicle pile-ups: When several cars are involved in an accident, the number of injuries grows. A multi-vehicle pile-up can be the result of one or more cars colliding and then skidding into oncoming traffic, or traffic that is heavy. Distracted driving can also be a factor in any of these accident types. Distracted driving involves driving while texting, adjusting radio or temperature controls, or any other action that takes the attention of the driver off the road. Since auto accident claims can be complicated, it is important that you secure the representation of an expert attorney with a strong track record. Chris Olsen has been practicing law since 2005, and started his own firm in 2010. Since then, he has collected millions of dollars for his clients. He settles most cases in pre-trial negotiation, but he is not afraid to go to court if necessary. If your case does go to trial, he can conduct a mock jury to scrutinize the strengths and weaknesses of your case in detail. In both pre-trial negotiation and litigation, he will work to secure the compensation and the justice you deserve. One of the most important duties a victim has is to seek the help needed to make a full recovery. Victims of auto accidents have certain rights, but along with those rights come certain responsibilities. One of the most important duties a victim has is to seek the help needed to make a full recovery. This includes not only medical attention, but also legal assistance. Attorney Chris Olsen will make certain the accident is properly investigated, ensure that the evidence is gathered and preserved, negotiate a settlement or file a lawsuit if settlement is not possible, and make sure the damages awarded are paid to injured persons in a timely manner. If you have been involved in an auto accident, contact us online or call our office at (619) 550-9352 to get the help you need today. The team at Olsen Law Offices can help you determine what to do immediately following a car accident.